A 20-year-old woman presented with haematemesis. Endoscopy identified gastric ulceration. Chest imaging (figures 1 and 2) and subsequent surgical biopsy confirmed pulmonary chondromas (figures 3 and 4). These benign cartilaginous tumours, typically found in young women, can form part of ‘Carney's triad’ with gastrointestinal stromal tumours (GISTs) and paraganglioma.1 Twenty-one years later, she developed further gastric ulceration, histology confirming a GIST (figures 5 and 6). She has now had 2 years of imatinib therapy and remains well. 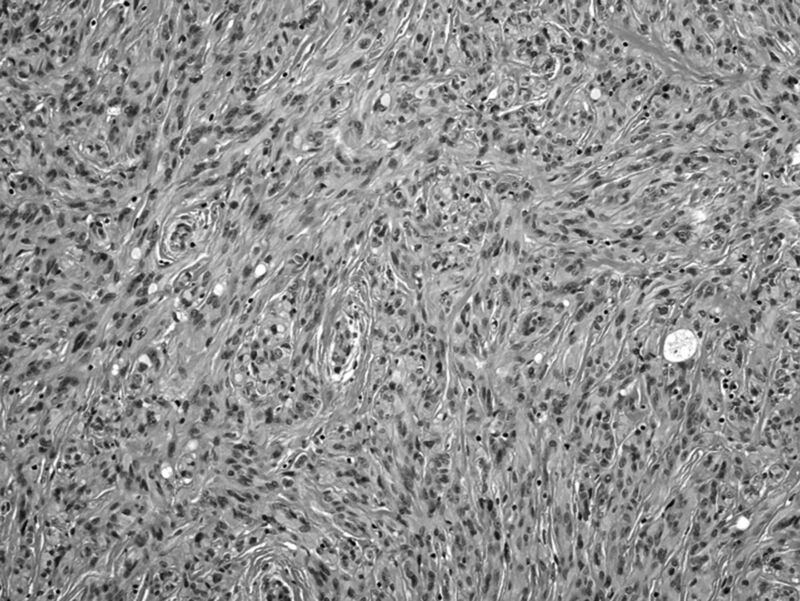 As yet, she has not developed paraganglioma or other organ involvement, but incomplete expression of Carney's triad is reported. Clinicians should be mindful that, albeit rarely, more serious extrapulmonary pathology can be associated with benign pulmonary chondromas. 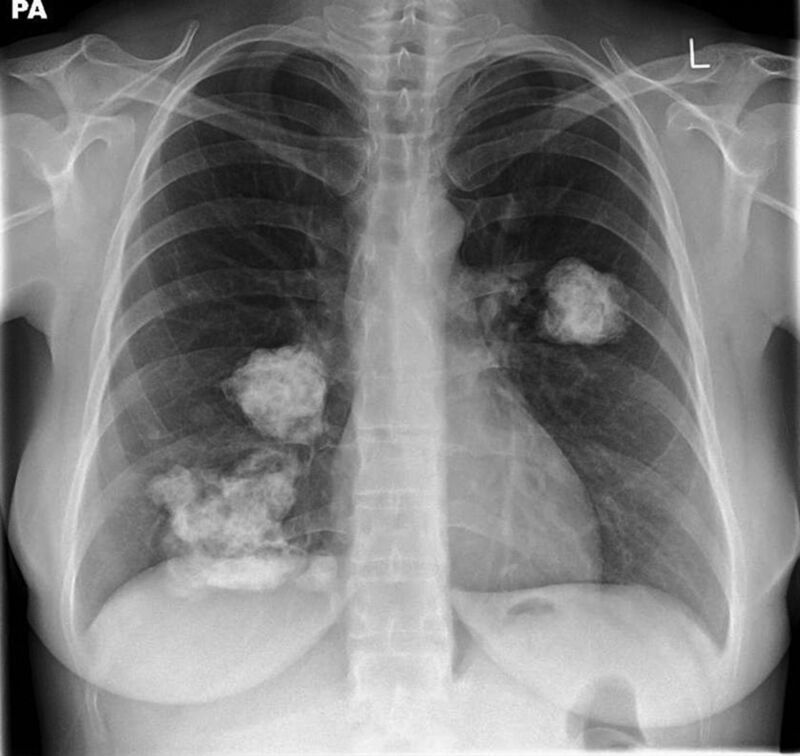 Chest radiograph showing multiple bilateral calcified lesions. 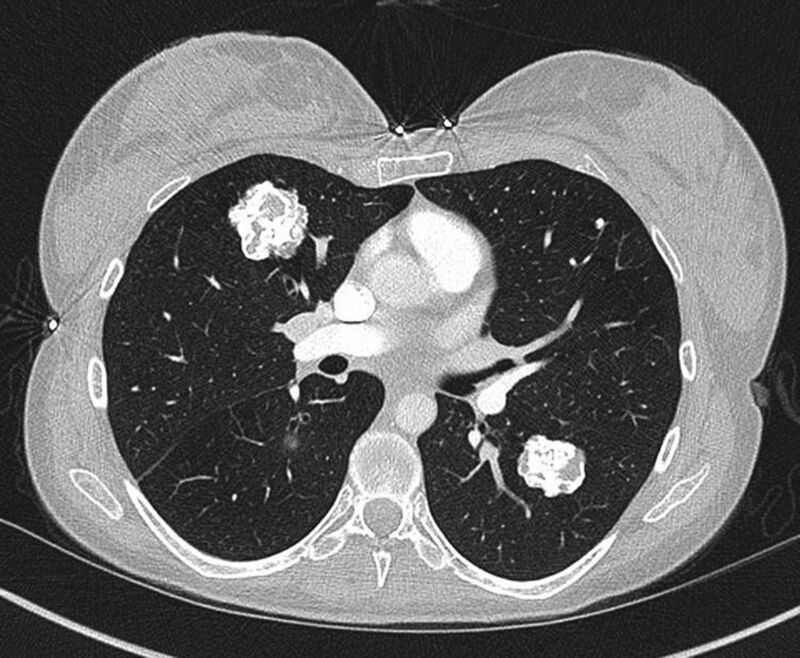 CT showing multiple bilateral calcified lesions. 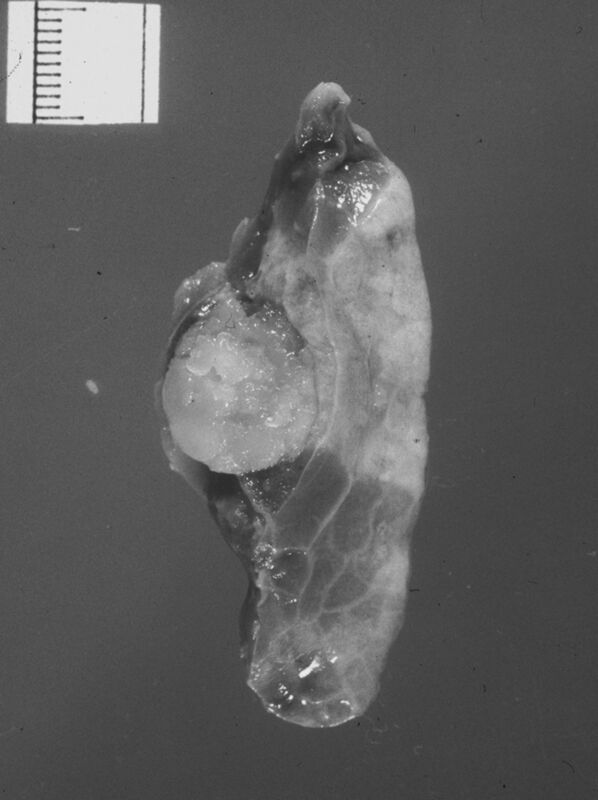 Wedge resection showing a 1.2 cm cartilaginous, well-circumscribed nodule. Pulmonary chondromas with low cellularity in chondroid matrix (×40 H&E). Highly cellular spindle cell tumour representing gastrointestinal stromal tumour (×100 H&E). 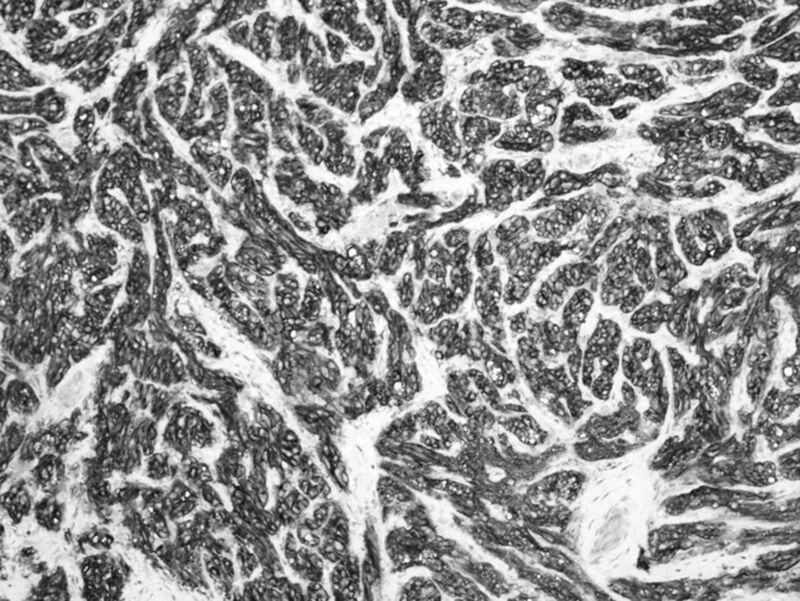 CD117 (cKIT) immunohistochemistry strongly positive in gastrointestinal stromal tumour (×100).
. Gastric stromal sarcoma, pulmonary chondroma, and extra-adrenal paraganglioma (Carney Triad): natural history, adrenocortical component, and possible familial occurrence. Mayo Clin Proc 1999;74:543–52. Contributors HHM and OD conceived the idea, wrote the manuscript and are guarantors of overall content. 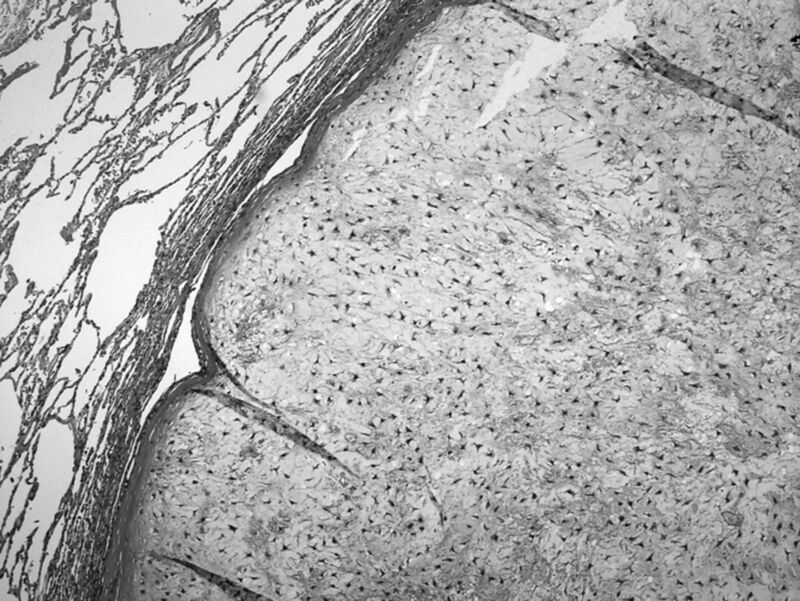 KMK provided histopathology slides and descriptions. All authors approved the final manuscript.